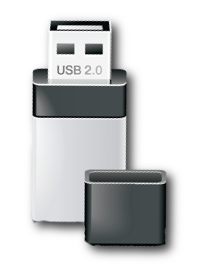 We offer 4 sizes of USB Flash-drives for purchase by our customers - 16GB, 32GB, 64GB and 128GB. Typically, we use SanDisk flash-drives. Pricing: 16GB $20, 32GB $35, 64GB for $50, and 128GB for $90. H.264 MP4 files: Standard definition - 2GB per hour of content, High definition - 5GB per hour of content. DV25 MOV files: Standard definition - 10GB per hour of content. High definition - 25GB per hour of content. AVI file types: 50GB per hour of content. From Anonymous of Atchison, Kansas on 9/27/2018 . Had the Cintrex digital products delivered on a flash drive this time instead of download. No problems, the drive was a solid brand same with sufficient space to hold everything. Great choice if you have data caps. From Jodie of -, Kansas on 5/8/2013 . I received the dvd's and they are great. I sent them on to family and they loved it. Thank you very much, you did a fantastic job.